Bernardo Maria Cremades Sanz Pastor, University professor and lawyer of the Ilustre Colegio de Abogados of Madrid, former Vice President of the London Court of International Arbitration, and member of the ICSID Panels of Conciliatiors and Arbitrators, is undoubtedly the Spanish best known and most recognised legal professional in international arbitration. He has been, and remains, the great master of arbitration in Spain; but his brilliant career is admired far beyond our borders, making him the best of our ambassadors. 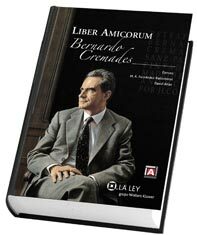 It is therefore no surprise that the Spanish Arbitration Club has decided to pay tribute to his long career with the publication of a book that gathers the contributions of more than seventy experts in the field: prestigious specialists from around the world that have paid homage to Bernardo Cremades with studies, written primarily in English, that cover the most important fields of arbitration.